Let your imagination run wild: come design and build an awesome LEGO city! Work individually or in teams to plan and create the city of your imagination! Explore new and cool building techniques. Calling all young engineers! Take your ideas and imagination and create something that really works! Learn about mechanical design, problem solving and teamwork. 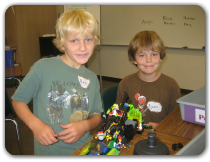 Build LEGO and LEGO-like robots (materials provided). 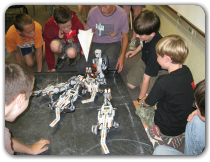 Program your robot to perform challenges and tasks. Take a look at a robot tournament on YouTube .